Utica, NY – Parade carries on a grand tradition of Irish pride and family fun. 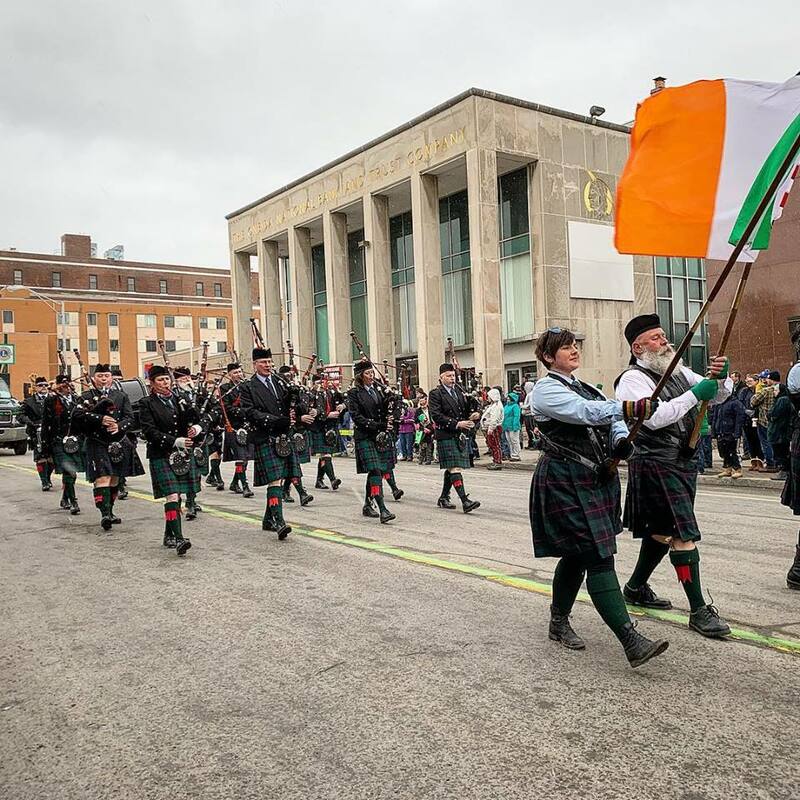 Marchers, musicians, dancers and vehicles of all sizes were out in force as Utica’s St. Patrick’s Day Parade, led by Grand Marshal John Sullivan, wended its way down Genesee Street, to the delight of thousands of Irish and Irish-at-heart onlookers. The parade — New York State’s third largest — featured over 120 units, all marching to the delight of kids of all ages. The event capped off a full week of Irish-themed and parade-related activities, including the Grand Marshal’s Reception on March 12th, the raising of the Irish flag at City Hall on the 13th, and the ceremonial painting of the “green line” down Genesee St. and a mass celebrating Ireland’s patron saint, St. Patrick, both taking place on the 15th. The parade got off to a running start – literally – as nearly 200 people braved the elements to take part in the 2nd annual “St. Patrick’s Day Mad Mile” road race, spurred on by parade-goers already stationed along the route. The spirit of giving also reigned, as 1111 food items and $1750 in cash were collected as part of the parade’s annual food drive to support Mother Marianne’s West Side Kitchen. Parade Co-Chairs David Wood and Patrick McGrath thanked all the volunteers who came out to help things run so smoothly. Specific thanks to our Parade Sponsors: Fahy Kitchens and Baths, Bank of Utica, McGrath, Myslinski, Karboski & Nunn Funeral Directors, and First Source Federal Credit Union. In addition, a huge thank you to WKTV NEWSChannel 2 for their broadcast of the parade!